We reviewed some basic keyword research concepts to understand. Now we will cover how to do keyword research. In this tutorial, we look at the most important keyword research techniques to use when you create your SEO content strategy. 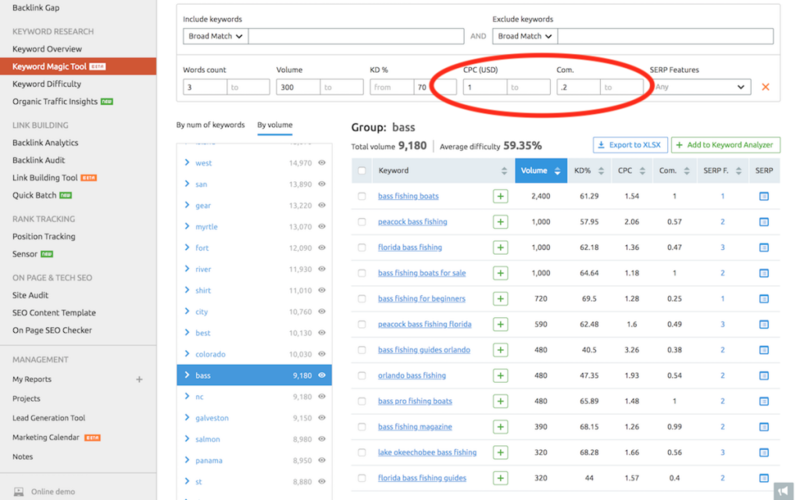 Brian Dean of Backlinko uses the Google Keyword Planner in his keyword research tutorial. It is a free keyword research tool. Over the years it has become clunkier and less intuitive. 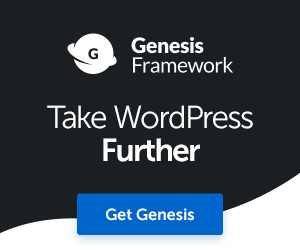 I understand they are re-launching the tool but I am not interested. Every iteration has been a step backwards from the original version. The purpose of Google Keyword Planner is to add keywords to Google AdWords campaigns. That is not what we are doing here. We are doing keyword research for SEO. A well known expression that I believe is 100% true. Free keyword research tools do not give you the features or data that you require to design a successful SEO content strategy. In this tutorial I will show you how to use SEMrush. 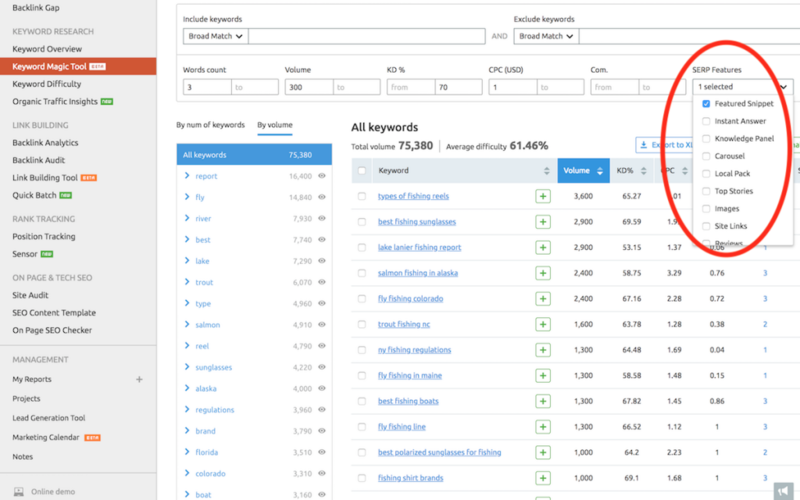 I believe it is the best keyword research tool at the moment. Use it and learn how to do keyword research better than your competition and improve your SEO quickly. 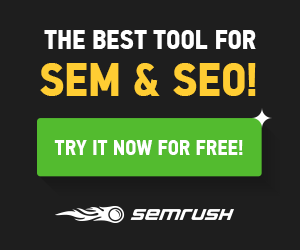 Don’t let the $99/month fee to access SEMrush persuade you to use free tools. They are a waste of time. I have implemented a couple big SEO content plans the past 2 years. The organic search traffic that came from the keyword research I did has paid for the tool many times over. 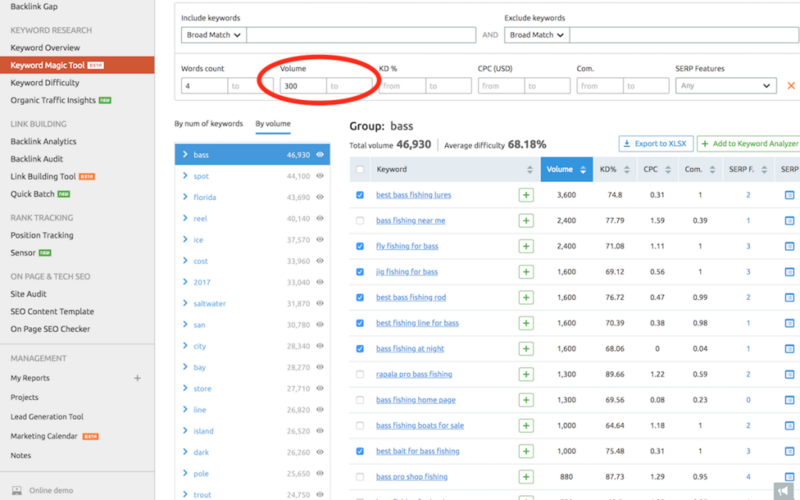 In one month (or less time) you can do enough keyword research with SEMrush to keep you busy creating content for an entire year. 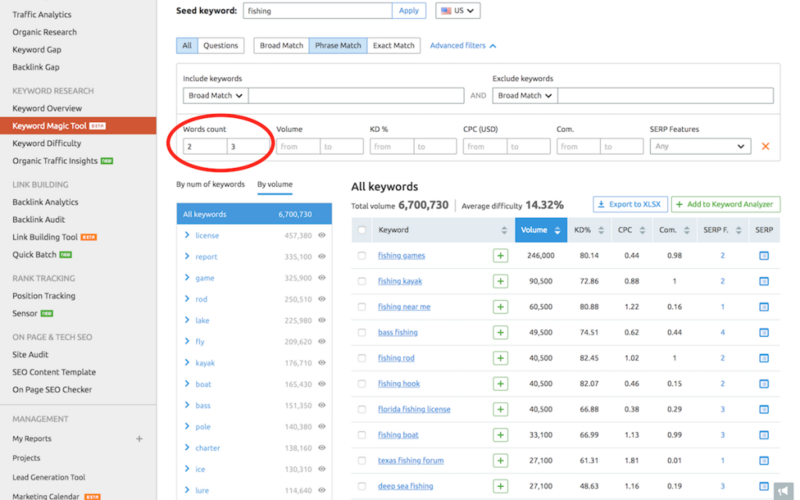 The Keyword Magic Tool (a feature offered by SEMrush) is incredibly powerful. It is shocking how much you can get done in just one hour. Alright, let’s get into this practical how to do keyword research tutorial! Before you use a keyword tool make a list of all the main topics that might be of interest to your audience. These main topics are your seed keywords. These are very big topics. SEO is an example of a very broad seed keyword. It is a topic of its own. Think about the most popular topics or categories of information that your audience wants. Next, list as many sub-topics related to these main topics. For example, on-page SEO is a sub-topic of SEO. So is keyword research. You will enter each of your seed keywords into the keyword research tool of your choice to find keywords that you can use in your articles. Body keywords are phrases that contain 2-3 keywords and have a high volume of monthly searches. Below, I have filtered my keyword list to only show phrases that have a word count of 2-3 words. 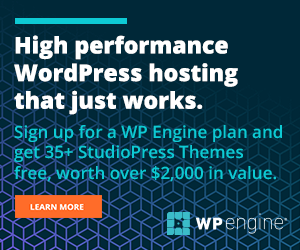 Body keywords are often great to use for your WordPress categories. Or, use them as focus keywords for the most important articles (aka cornerstone/foundation/base/pillar articles) on your website. An example of a body keyword in this screenshot would be “bass fishing”. 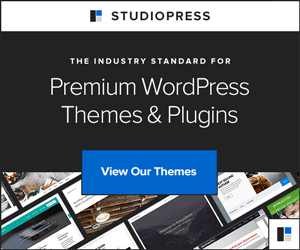 If you use a Studiopress theme (for WordPress) you can easily create category pages that work like cornerstone pages. 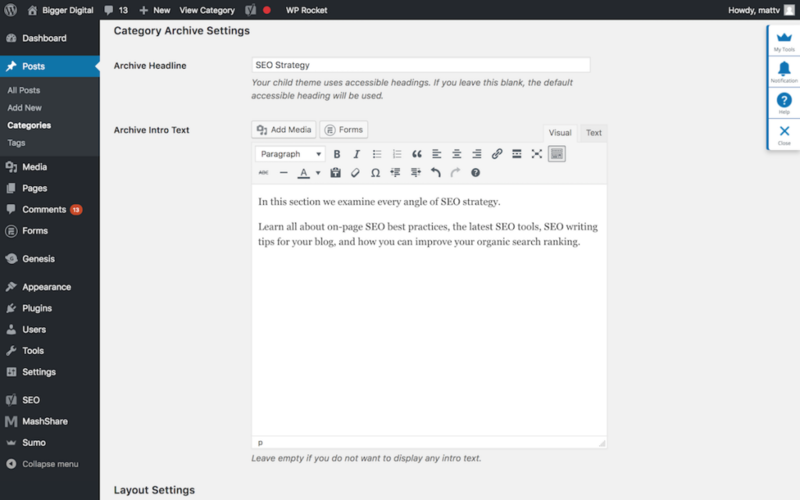 When you edit a category, there is a section (see below screenshot) that allows you to enter an Archive Headline and Archive Intro Text. I have not completed the example below, however I will write a more complete introduction to SEO in this space. Treat it like a long comprehensive article of 1000+ words and drive more traffic to your category pages. Otherwise, if you would like more flexibility to write a super long article, use your body keywords for your cornerstone articles. Make sure these articles are very long complete articles. Aim for 2000+ total words. Talk about every single relevant topic and sub-topic. Identifying body keywords that you can align with your site structure is critical to your overall SEO content strategy. 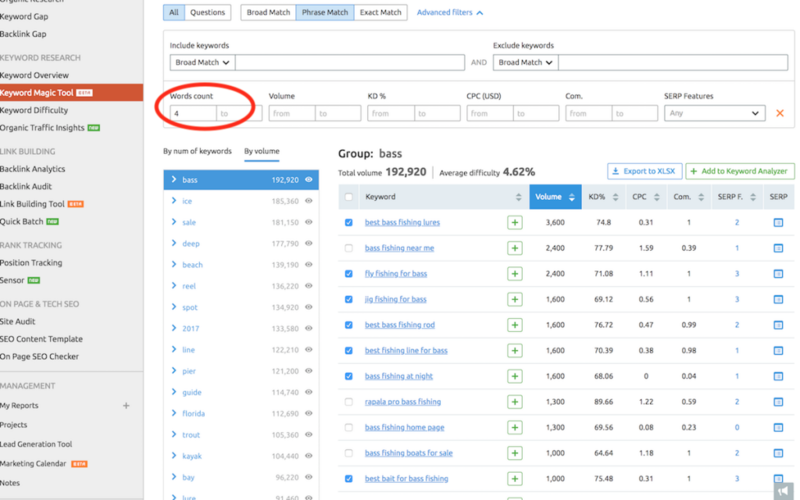 This is how to do keyword research like a pro. Long tail keywords generate the most organic search traffic for most sites. These are most often phrases that contain 4+ words. In some cases you might consider a 3 word phrase to be a long tail keyword. You should include as many as you can in your articles. Long tail keywords can be sub-topics to your main article topic. Write something useful about each of these sub-topics. Use long tail keywords as headings and sub-headings in your articles. In the screenshot below I have filtered SEMrush to look at only long tail keywords that are 4+ words. You can see that I have selected some long tail keywords that I could use in an article. They are all valid sub-topics to the main topic “bass fishing”. If I were to scroll down the keyword list (in the screenshot above) further I could definitely find more great long tail keywords to use in a huge article. But this is definitely a great start. I would probably apply Heading 2 formatting (as seen below) to each long tail keyword and then write something about each. These are really great sub-topics. This is the way to write a very complete information-rich (SEO) article. These types of articles currently dominate page 1 in Google. A bonus to using the Heading 1/2/3/4 formatting is that it improves your readability score. I find that a high readability score is mandatory for high rankings these days. Can you see how both body keywords and long tail keywords can be used to structure your content? Put extra time into this third step of how to do keyword research. Doing long tail keyword research is very important. The goal is to create pages that trigger as many long tail keyword searches as possible. Now you know how to pick out both body keywords and long tail keywords. Next, I show you how to filter for the best keywords. Isolating the keywords that are best and easiest to rank for is an important step in how to do keyword research effectively. There is no point to targeting keywords that have a search volume of under 100 searches per month. Why? If you are not ranked number one/two/three in organic search for such a keyword, you probably will not get any traffic. 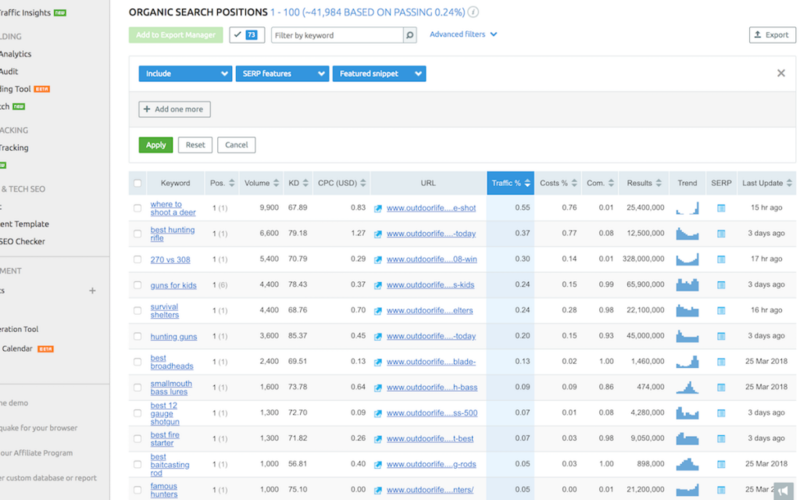 You are sharing the total search volume for a keyword with everyone that is ranked on page 1, and possibly page 2. Thus, you will only get a portion of that search volume in total clicks through to your site. There is definitely a sweet spot of search volume to consider. The higher the search volume the greater the keyword difficulty or competition. Here I filtered for long tail keywords that have at least 300/searches per month. If you can, filter for even higher search volume. It depends on the niche and the total number of search terms. I prefer to bump the search volume filter to 500+ searches/month. The lower the keyword difficulty the more likely you can get ranked on page 1 of Google Search. In the screenshot you can see that I set a limit of 70%. This filter has narrowed the number of keywords shown compared to the last screenshot. Filter as low as you can when you are starting out. As your site builds authority you can increase the keyword difficulty score filter. I like to filter my keyword lists for higher Google AdWords cost-per-click (CPC). This is a good tactic for content sites that depend on ad revenue. The higher the CPC the better. A higher CPC means that the average value of the advertising that is likely to be shown on my pages will be higher. Thus, more ad revenue for me. This niche (fishing) isn’t the greatest example because the CPC’s are generally low. I would prefer to see the CPC be greater than $3. You can also filter your keyword lists for the competition between advertisers (Com.) that are bidding on Google AdWords keywords. This is measured on a scale between 0 and 1. Over 0.5 would be ideal. The more advertisers competing the better. Using keywords with a higher score will also likely increase the value of the ads shown on your website. It is an indication that there are many product manufacturers, service providers and advertisers competing. In addition to higher ad values there is also probably a greater opportunity for affiliate marketing revenue. 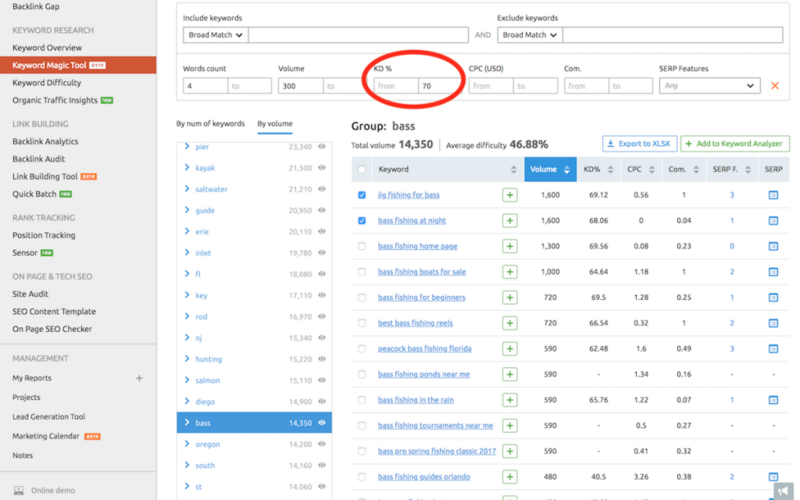 The other great feature of SEMrush is that you can filter for keywords that trigger special SERP features such as featured snippets. I like to do this because it is a way to get ranked at the top of the page. Position zero. Featured snippets are shown below paid listings and above the traditional organic search listings. Steal away clicks from the number 1 ranking, or complement your own number 1 ranking. SERP features give you greater visibility and deliver more organic search traffic. Do you feel like you know how to do keyword research like and SEO expert yet? Well, we are not quite done. I am saving the best keyword research tips to complete this tutorial. Next we learn how to pick apart the competition using SEMrush. So, now you know how to pick out the right keywords doing your own keyword research. But what have your competitors been up to? Studying what keywords and pages of content that are driving your competitors traffic is a fantastic way to increase your own organic search traffic. This is exactly how I increased my visibility substantially over the past 2 years. Doing competitor keyword research and analysis is how you dominate your niche. Look at the keywords generating their traffic. Look at the landing pages triggering the keyword searches. Create better content that is using a wider variety of keywords: body keywords, long tail keywords, and question keywords. 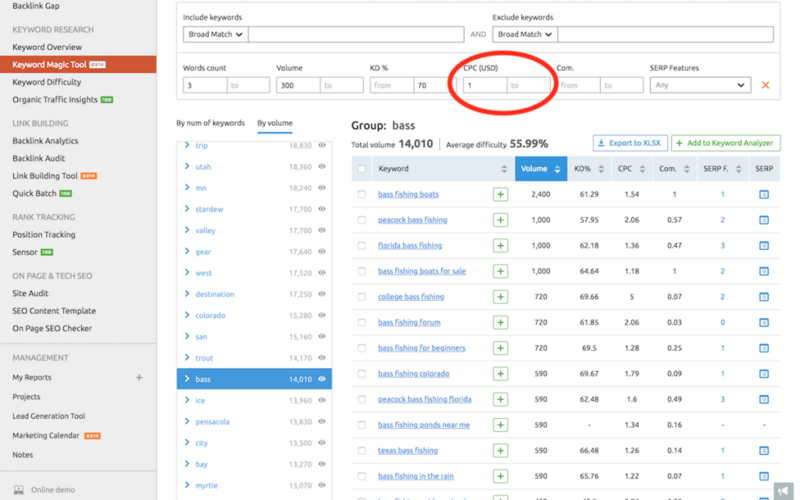 Competitor keyword research using SEMrush. First, enter a competitor domain and click search. Under organic research you can look at positions. This shows all the search queries and pages that are generating your competitors organic search traffic. You can click on the SERP icon for any query to see the Google search results. 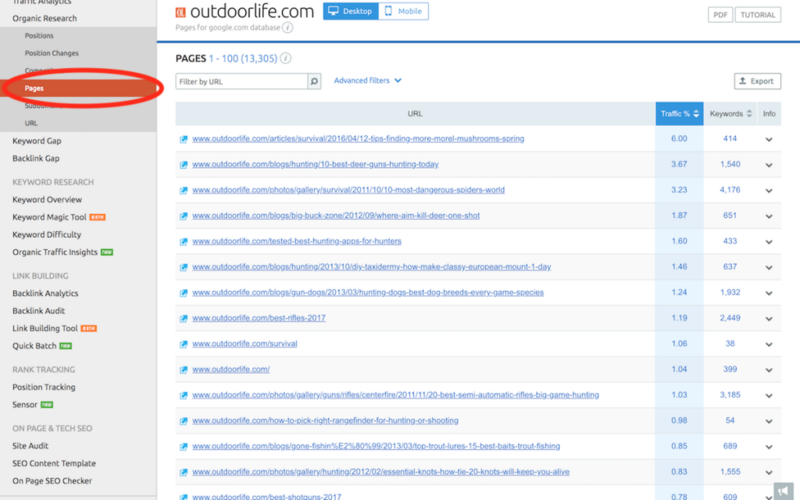 Analyze all these pages of your competition. Create better content. In the slide above you can click on various types of SERP features like featured snippets. Below you see the results. Review each keyword and URL that is triggering the SERP feature. Look at other (competitor) results by clicking the SERP icon. Analyze the content and make a better offering. Under Organic Research, click Pages. 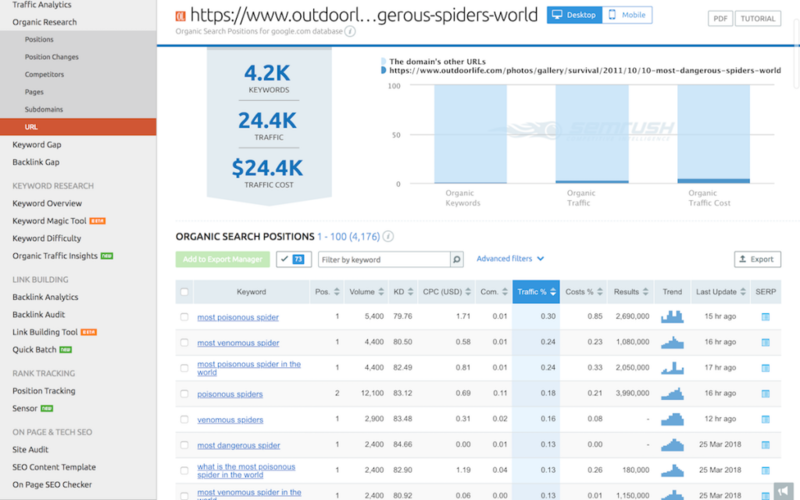 This report shows what pages are generating your competitors organic search traffic. Look at each page in this report and create better content on your site. You can also see what keywords are triggering impressions for each page indexed in Google Search. Simply click on one of the numbers in the keywords column. You will see a report like the one in the next screenshot below. Try to create content that will get ranked for as many keywords as possible. To do that, use as many relevant long tail keywords in your articles. This approach is way more efficient than writing multiple articles targeting less keywords. Short articles will not perform well if at all. 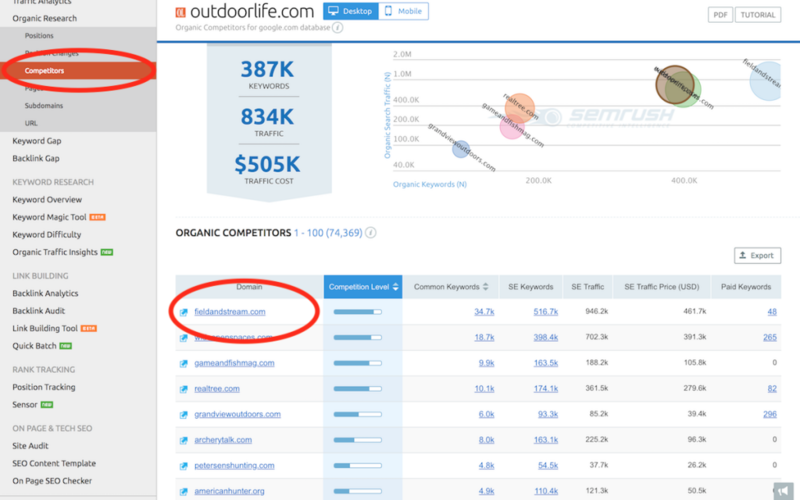 Finally, if you click on Competitors under Organic Research, you can see where this competitor is positioned on its competitor landscape. Now it is time to repeat your competitor keyword research and analysis for these additional domains. Doing competitor keyword research will increase your visibility and build tremendous authority for your site. If you do not do competitor keyword research it will be difficult to dominate your niche and be number one. Saturate Google Search and create content for every single topic that is relevant to your audience. Competitor research is the most important step of how to do keyword research for your blog or website in a very thorough manner. 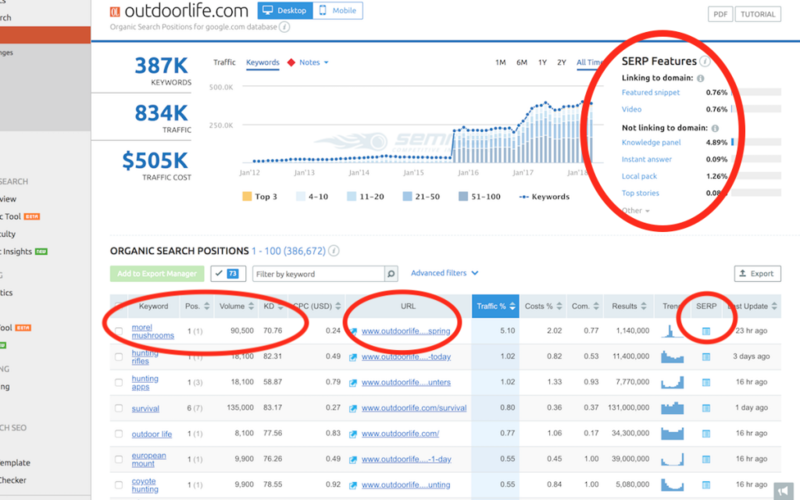 NEXT Part 3: Using the Keyword Magic Tool by SEMrush. For more tips on how to do keyword research take a look at my keyword research checklist.